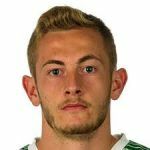 Raith Rovers today secured the signature, on a permanent contract until the end of the current season, of midfielder John Herron. John (23) has been training with Barry Smith’s squad for several weeks and arrives at Starks Park with a wealth of experience, having started his football career at Celtic and then moving south to Blackpool in League 1 and 2. In addition, he had loan spells at Fife clubs Cowdenbeath and Dunfermline Athletic. A skilful playmaker, John has won Scotland caps at every level from u15 to u21 from 2009 to 2014.